The pet hate of most growers of species orchids is surely name changes. The Latin names of many species are hard enough to memorise (and learn to spell) in the first place. It’s annoying enough when a second taxonomist tells us that the first was wrong and suggests a new name but when a third taxonomist then says that the second also got it wrong and suggests a third name, then it’s enough to make one cry! However, these taxonomists don’t recommend name changes solely to annoy us (maybe not even just to see their names in print!). There are two main reasons they do it. The first is to ensure that the person who first described the species (in sufficient detail so that it can be identified by others as a unique species different from all other species) has the right to confer his chosen name to that species. The second is to correct any errors in the literature. In the early days many superficially similar orchids were lumped together under the same genus (initially they were all called epidendrums) and it is now logical to assign them to a new group. Many American species orchids were at first lumped together in the genus Odontoglossum, which translates literally as toothed tongue, referring to tooth-like structures on the lip. But in recent years, some of these orchids have been transferred to new genera as they belong to clearly different groupings. One such genus is Osmoglossum, containing seven species, although most of us are familiar with only one, the widely grown Osmoglossum pulchellum. Incidentally the correct pronunciation is pull-kell-um, not the almost universally used pull-chell-um (in Latin ch is pronounced as k). 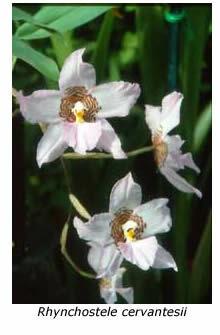 The genus name translates as odour-tongue, and refers to the beautiful fragrance of the above species. 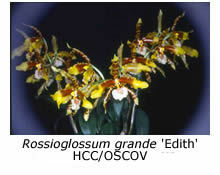 Fourteen Mexican and central American species once known as odontoglossums have suffered two name changes in recent years, first being moved to the genus Lemboglossum and more recently (in 1993) to the genus Rhynchostele. 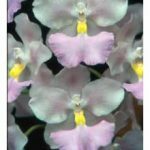 They are widely grown in Victoria, some of the most well known being Rhynchostele rossii, R. bictonensis, R. uro-skinneri and R. stellata. One species, which doesn’t fit into any of the above genera, although once known as an odontoglossum, is Cuitlauzina pendula. Its genus name is derived from King Cuitlahuatzin of the Iztapalapae people, known for introducing rare plants to gardens in western Mexico. I believe that the correct pronunciation is Sweet-la-zeena. 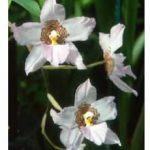 It was formerly known under a variety of names, including Odontoglossum citrosmum, Odontoglossum pendulum, Oncidium citrosmum and Oncidium galeottianum. 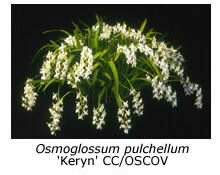 It’s an attractive cool-growing species bearing pendant inflorescences of whitish flowers with striking pink labellums. 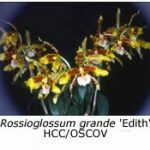 Another genus made up of six species now removed from Odontoglossum is Rossioglossum, named after J. Ross, who collected orchids in Mexico in the 1830s. It includes some of the most attractive cool-growing orchids in our collections, namely Rossioglossum grande, R. schlieperianum and R.williamsianum. 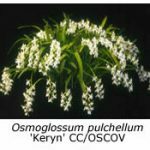 These species can be successfully grown and flowered in a ‘cosy’ shade house in Melbourne, although they may do a little better under intermediate conditions for some growers. Sources. J. Stewart (ed. 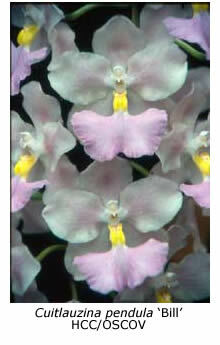 ), Manual of Orchids. The Royal Horticultural Society, 1995. F. Beukelman, J. Orch. Species Soc. Vic., 2001, 19, 6.